After listening to a number of people who went to the Consumer Electronics Show (CES) last week, the anecdotal evidence suggests that 3D printers stole the show. And one of the biggest announcements there in the area of 3D printing was the unveiling of 3D Systems’ new CubeX. Judges at the show obviously agreed, and CNET awarded the CubeX Best of CES 2013 in the Emerging Tech category. Quite an honor. Congratulations 3D Systems. 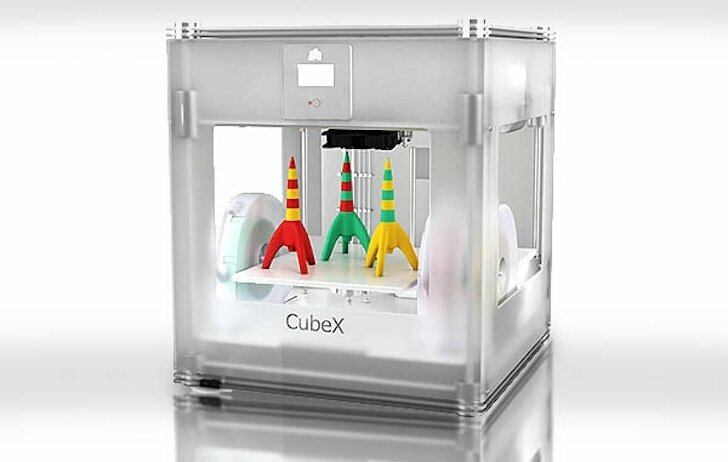 The CubeX is a huge step up from 3D Systems first, affordable desktop printer, the Cube (second generation announced at CES). The new CubeX has the largest print volume in its class (1030 cubic inches of space, with dimensions of 10.8″ x 10.45″ x 9.5″), and it prints in either ABS plastic or more eco-friendly PLA, even both simultaneously. But not only can you print in two materials, but you can print in three colors at the same time if you choose the upper end printer. The three print head model, called the CubeX Trio, will set you back $3,899. But you can get a two head model, the CubeX Duo, for $3,249, and the entry level model, simply called the CubeX, for $2,499. The CubeX and the CubeX Duo are both upgradable to the next model. The company is now accepting orders for shipments beginning on February 8, 2013.